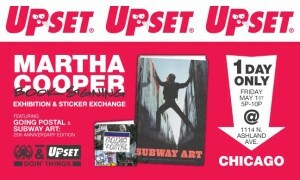 For the first time in her thirty year career, famed street photojournalist Martha Cooper will be coming to Chicago to release the highly anticipated 25th anniversary edition of Subway Art published by Chronicle Books. The new edition of Subway Art features new photos and text and comes in a beautiful large-scale format. Going Postal, Cooper’s new book about the burgeoning postal sticker art scene in New York will also be available. Both books will soon become street art and graffiti staples. MR. THOR will be creating an art installation for the space. To coincide with the Going Postal book release, Upset, a collective of artists from Chicago and New York, presents a handmade sticker art sale featuring work from many of the artists in Cooper’s postal sticker art book. Over 30 artists from New York and Chicago are involved in the sale. All stickers sell for only $5 and artists are also encouraged to bring their work and exchange stickers with other artists. Featured artists include Blanco, C-Damage, Faust, Overconsume, Stomach, and more. The Making Deals zine premiere takes place at the Novem Studios store, only a few doors down from the Martha Cooper event. The New York City based zine compiles images and interviews with people creator Frank Serpico finds personally interesting including graffiti, drug dealing, 70s cinema and sports, and urban mayhem with a focus on New York and Chicago—the artist’s hometown. Making Deals Issue One is printed in a limited edition of 100 and features an interview with Chicago graffiti legend Sivel. For the premiere, Serpico, who is also co-founder of Upset, will have illustrations and paintings available for sale. 1114 N. Ashland Chicago IL.